It's not a full review because, well, I didn't actually USE the product. I'm pretty sure I mentioned when my samples came that they sent me the fake nails in addition to the eyelashes, even though I only asked for the eyelashes. I wasn't going to review them at all because, while I don't have any real problem with fake nails or anything, they're just not for me. And especially not these. Let me backtrack a little. Let's talk about the positives of this product before I start railing on it. The 2 designs that I received, both from the Runway Collection & both listed as Medium Length, were Sequins (left) & Starlet (right). The more detail-oriented side of me noticed one has a red label & one has a black label, I'm not sure if that means anything special in Revlon code. One of the positives I guess would be that I like the packaging, although I thought the little sticker ("Compares to $50 Salon Style") was kind of unnecessary & over the top. And unbelievable, although I guess I'm not the one to consult on salon manicure prices, but really, $50.00? It's just a decorated french tip people! If that's the case, I save more money than I thought doing my own LOL. Now, on to the not so positives ... I don't want to call them negatives, because on someone else, none of these might turn out to be a problem. 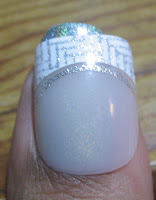 The first is with the shape of the nails - they're very curved, side to side; too curved for my nail. Here is where I admit that I didn't wear them, and maybe the glue would keep them stuck to however much curved of a nail you have. Or maybe not. They're WAY too short. Even on my thumb & index finger, which are shorter than I prefer right now, I still have nails peeking past the edge. Most of these, for me, are barely longer than the length of my nail bed. Now, granted, since I'm 5'8" I do have matching big hands, but I don't feel like my nails are so gigantic that this is excusable. I'm going to try & remember to look & see, next time I'm at a store that carries these, if they actually sell any designs in a "Long" length since both of these sets are medium. Considering how little I care for these however, I'm not going to put too much brain power towards the task & I make no promises of ever mentioning these again. The long & short of it is, as expected, that fakes nails, and these fake nails in particular, are not for me. I would not purchase these for myself. But I have seen them reviewed positively on other blogs. This is another reminder that I need to decide on a real ratings system ... maybe 1-10? 1-5? This product would be low-middle range, maybe a 3 or 4 on a scale of 10. Sorry Revlon. Maybe just send me some free polish next time LOL. Midnight Star is really nice, love the shine even under the natural lighting. 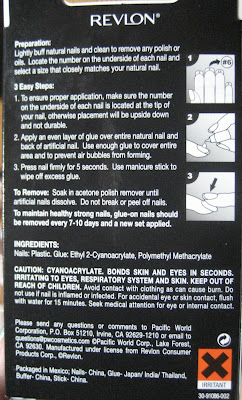 That was a very informative review on the fake nails! I have these nails to review too. But some of my nails are too long. I'm having the problem of not finding enough small nails. Any way...love that I'm not the only one,"brave and daring"! With showing the feet...lol! I find false nails to not be wide enough for me. I love all these pre-painted ones, but they don't have enough wide sizes :o( So I am not buying them anymore. Lucky girl to get free products to review! Very pretty toe-nail polish. That purple is very rich and a good choice for toes. Hi Colette! Those nails are pretty and I'm not a big fan of French manicures. I've never tried them. I like the toe nail polish. Nice purple. Looks pretty on your toes. I too rec. these, and they are too short for my nails for me to use. And as long as it took for me to get my nails a-growin I'm not about to cut them to try these out. My little sister just clipped her nails though, so I'm trying to talk her into it. Yeah, can you believe it? $50 for a salon set of french acrylic/gel is actually pretty cheap, I normally see them priced around $65 at a nice salon! Almost all of the nails were too big for my fingers though, so I had the opposite of your problem! VELVET - I think my feet would still be in hiding if I hadn't done a poll that proved people were more interested in the polish than in what body part it was shown on LOL. 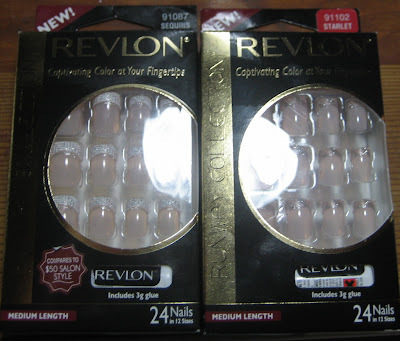 DEEZ NAILS - I was so surprised to be contacted by the Revlon rep! & still looking forward to trying the lashes, hopefully I'll have time this upcoming weekend. LUCY - Plain french manis can be kind of boring, but the designs on these are just enough to add some interest. BROOKE - Your nails are growing out so nice =) & I love that your family makes such good nail guinea pigs for you to practice on =) I love seeing the manis you do for your mom & sisters. SCRANGIE - Wow! I've never had my nails done professionally, I really had no idea they were that spendy. I do like the designs on them, I found myself comparing to some of the french tip Konad patterns & thinking about how I could try to re-create them freehand also. That's funny you had the opposite problem with size - somewhere out there must be the person with the size nails they based these on LOL. I love the books, too. I'm a huge urban fantasy fan, and you read a lot of the same things I do.